What a wonderful start to Women’s History Month—speaking on March 1st to high school girls at Resurrection College Prep High School in Chicago about my mother’s story and the story of the women who served in the military in WWII. The students were so attentive! I am so excited— just booked my first presentation of 2020! I am so grateful and honored that people are still eager to hear my mother’s story ten years after we published our book. I wish that my mother were still here to be a part of this. Thank you, Mom, for all you did and for your service to our country in WWII. I miss you every day. 2020 is the 75th anniversary of the end of World War II. I had the pleasure to meet Jenny Share at a joint meeting of MWA in October. She writes a blog about her book passion. I am incredibly proud to have been selected as a Road Scholar from Illinois Humanities for the next two years to continue telling my mother’s story, Mollie’s War. This is the story of the women who served in the military during WWII. I have had the privilege and opportunity to travel across Illinois as part of Illinois Humanities over the last four years. If you are looking for an interesting story for your group, please contact me. This year is Illinois’ Bicentennial celebration and we have had the privilege and honor to be a part of Illinois Humanities Road Scholar Speaker’s Bureau Bicentennial edition. We’ve met so many interesting people– as we traveled throughout the state– who served our country whether in WWII or subsequent times. We met some people who talked about their mothers being Rosie the Riveter, fathers and mothers serving in WWII all over the world. One woman talked about a friend who was a WAC and was in the same WAC recruiting movie as my mother. Her mother used to go the movie theater every day to see her daughter in the movie. I also learned so much about the WACs stationed in Illinois. WACs during WWII served in most states in various capacities at the army bases. They were assigned to replace soldiers for overseas duty based on the need of army camp/post. Most were placed in clerical jobs. However, some performed nontraditional jobs such as radio operators, electricians, and air-traffic controllers. University of Illinois was a major military school during both WWI and WWII. In 1943, they were the first university to establish a WATC program–Women’s Auxiliary Training Corps— which set an example for other universities to follow. The WATC prepared female students for the WAAC/WAC just as the ROTC prepared male students for the Army. The first contingency of WACS was assigned to Camp Ellis in Fulton County in January 1944. Camp Ellis was a United States World War II Army Service Forces Unit Training Center and prisoner-of-war camp. Since the WACs were experienced in the Army routine, they started working in their new jobs within a day of arriving. In fact, two of the WACs because of their skills as telephone operators, were assigned as the telephone operators for the famous Roosevelt-Churchill Conference at Quebec, Canada in September 1944. In April 1945 a unit of African American WACs who were medical technicians was assigned to Gardiner Hospital in Chicago. So excited…..I just booked my first speaking engagement for 2019 at the Poplar Creek Library in Streamwood, IL. It is in March during Women’s History Month. We had an amazing Women’s History Month as we traveled across Illinois telling the story of my mother and the other WACs who served during WWII. And because this is the Bicentennial of Illinois and I am a Road Scholar again we also told the story of many women who served in Illinois. Many people shared stories of growing up during WWII even if they were children. Some people talked about the food rationing and growing up on farms. One man talked about how his father was not allowed to serve in the military because he had to continue growing the food on his farm. There were so many interesting and remarkable stories. One woman talked about a WAC she knew who was in a WAC recruiting movie–probably the same one as my mother (It’s Your War, Too)–and how her mother would go to the movie theater just to see her daughter in the movie. We met a 93-year old woman who worked in Washington DC doing coding and translation of Japanese. One woman talked about being a nurse in the Navy during WWII…..she signed up with a friend but the friend didn’t pass the physical and so she continued on in the service without her friend. One man talked about his father who was a B-17 pilot but because he ranked second in his graduating class he became the instructor and never left the USA. There was one woman whose father was stationed in Europe the same time as my mother and she wondered if her father may have been one of my mother’s boyfriends in Paris…wouldn’t that have been a coincidence?!!!!! But I did not see her father’s name in any of my mother’s letters. One woman talked about her father who served in WWII and how she never heard any of his stories until she started taking him to reunions with his war buddies–and then the stories just flowed. And that is the story of The Greatest Generation!!!! It’s March and that means Women’s History Month. 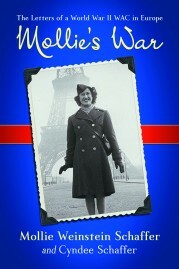 It is always an exciting time for us as we tell Mollie’s story and that of the women who served in the military in WWII. Happy New Year from Mollie’s War. We had a wonderful 2017 traveling across the state of Illinois. We have traveled from Antioch to Sandwich to Crete to Rock Island to Mount Vernon and all places in between. We’ve seen parts of Illinois that we didn’t know existed. We truly have a beautiful state—from the River Walk along the Mississippi in Rock Island to the working windmill in Fulton to the historical sites in Mount Vernon. For the first time we traveled out of Illinois to Milwaukee and presented a program at the VA Medical Center in Milwaukee. We met such interesting people including a gentleman who was one of five brothers who served in WWII and everyone came home! Many women talked about female relatives–mothers and aunts– who served in WWII and in fact woman talked about an aunt who served as the head of the WACs in the 1960s. Another gentleman talked about serving during WWII on a aircraft carrier in the Pacific when he was 17 and how he aged to 90 in just 10 days. But he said he would do it over again! A WWII Veteran who landed on Normandy in the first wave told his first-hand account of the landing and driving a jeep. One woman talked about growing up in Iowa, seeing the WACs as they drilled (at Fort Des Moines) and how the WACs would go to church in the neighborhood. There are just so many stories! I heard today that my presentation, “T he Journey to Mollie’s War: WACs and WWII” has been selected to be included on the Illinois Humanities Bicentennial edition of its Road Scholars Speakers Bureau roster. In addition to sharing my mother’s story about her service in WWII, I will also talk about how my mother embraced Chicago (she was from Detroit, MI) and made it her home town! 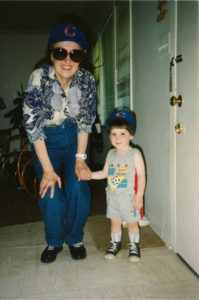 This is a picture of Grandma Mollie with her grandson (our son Jordan Schwartz) in the late 1980’s. What could be more Chicago???? ?